When we take away wild places for wild animals, those animals find ways of showing up in our backyard. Because it was their backyard first … When that animal is a predator, all hell breaks loose, suburban-wild style. The anti-predator myth is exemplified by this week’s hysterical reaction to a mountain lion under a house that borders Griffith Park. It illustrates a cultural paranoia we must conquer if we are going to coexist with wild animals. We don’t have wolves to demonize here in California (other than OR-7, vacationing with his family in Southwest Oregon). We have mountain lions. In the past 30 years, three people out of more than 30 million have been fatally injured by a mountain lion; less than a dozen fatalities in 125 years (a handful more if you add Canada and Mexico). California Fish & Wildlife estimates a person is 1,000 times more likely to be struck by lightning than attacked by a mountain lion. So why are we so afraid? Very few people ever see a mountain lion. Coming “eyeball to eyeball” with the lion known as “P-22” in a crawlspace, a worker installing a security system had the surprise of a lifetime this week. But journalists exploited this drama. With apparent glee, they treated this wildcat nap like a car chase or a hostage crisis. Reporters were licking their lips waiting for the armed cult leader to finally drive off the road or open fire on children. Or crawl out from under the house. Wildlife officials poked that dang varmint with a stick, they shot beanbags at him, hell they even shot tennis balls at him. But that sucker was resistant. In a safe,dark place, he stayed put, while firefighters, wildlife officials, and reporters went nuts. CA Fish & Wildlife finally realized that (as any owner of a cat can tell you) the best way to get him to come out is to leave him alone. And when they did, he left. So the news that obsessed media for a day was that a wild animal crawled under a house that borders a 4,300 acre park (5x larger than Central Park) where the animal lives. Why is this news? Because of the myth and the lore that surrounds apex predators. Suburban sprawl into wild areas guarantees some overlap with wild animals. That’s why we must talk about protecting native animals by protecting their land and leaving them alone. Instead, there was only panic about the dangers of wild animals and a demonizing of predators. Mountain lion attacks are extremely rare. Even seeing one is unusual. Mountain lions—aka cougars, pumas, or panthers—are shy, solitary, and stealthy apex predators. They are the ninjas of the California animal world—and they want to be left alone. Lions are not often seen skipping down the mountainside, being goofy, like dogs and coyotes. Mountain lions are, after all, cats. Only in exceptional cases do they allow humans to see them. Mostly, mountain lions are there only when you have no idea they’re there. As apex predators they are vital to our environment. Destroying mountain lions, by usurping their habitat, destroys entire ecosystems. And that’s just what we’re doing. 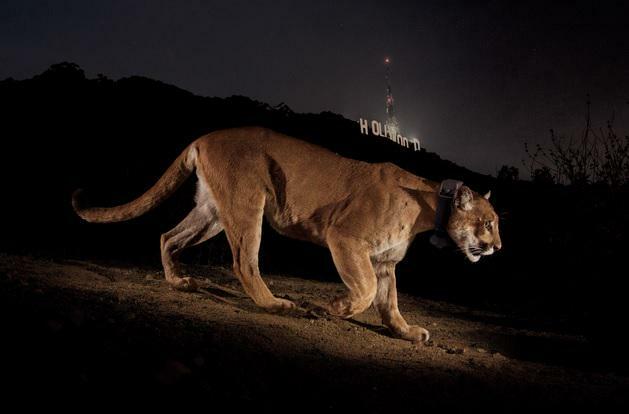 There are only 4-5,000 mountain lions in California. Culturally, we love identifying with predators, becoming them, temporarily as mascots and tattoos: wildcats, lions, tigers, wolverines, bears. Unfortunately, people also like shooting them too—the combination of desire and fear is the attraction we feel when we don their likeness in symbolic ways to harness their mythological power. Dominating a dominant animal proves our power, so some seem to believe. Yet we are terrified of coexisting with these predators. That is the suburban mystique all over again: we long for the wild within, while massacring the wild without. We need to stop mythologizing animals and instead respect them by leaving them alone, and protecting their legal rights, lands, and lives. Coexisting—as anyone with roommates and teenage family members knows—is usually about leaving each other alone. We must make our decisions as a balance between science, ecology, and the highest common good, which includes the interests of animals and the Earth. On June 5, 1990, Californian voters approved Proposition 117 – the Mountain Lion Initiative – (called the “People’s Initiative” after Mountain Lion Foundation volunteers gathered more than 680,000 signatures to put it on the ballot). Prop 117 did two important things: it banned trophy hunting and it helped save land for mountain lions to stay wild. Prop 117 created a Habitat Conservation Fund of $1 million a year until 2020 to “acquire, enhance, restore” wild lands for wildlife. That Proposition also changed mountain lions from “game” hunted for “sport” to “specially protected mammals” who aren’t allowed to be killed for fun. A property owner can kill a mountain lion who threatens humans or animals only with a depredation permit. This permit is required by law and even with this permit a person is prohibited from the use of “poison, leg-hold or metal-jawed traps and snares.” Breaking this law can lead to criminal charges. What is usually shared when discussing predators is what to do when you encounter one; people are given a tip sheet for resolving confrontation at an individual level. What is not discussed is how to prevent and avoid confrontation at a socio-cultural level, because that would involve doing things we don’t want to do, like not treating the Earth like a parking lot, not acting on all opportunities for suburban development, and not thinking only of our own immediate interests. Mountain lions try very hard to avoid people, but often coexist around us, unseen and unheard. Mountain lions are found where deer are found; deer are their primary food. 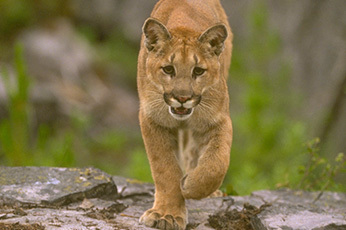 Mountain lions are especially found in the foothills and mountains. Mountain lions who reveal themselves to humans may suffer rabies or be desperately starving. Mountain lions who threaten humans are immediately killed – about 100 are killed every year: they can’t be moved (due to conflicts with other lions and revisiting issues). Don’t feed or attract deer – it attracts mountain lions and it’s against the law. Don’t feed raccoons and other mountain lion prey: don’t leave pet food outside. Not attracting deer means avoiding plants deer like to eat. Not attracting a lion means trimming hedges that offer hiding places. Don’t leave children and pets outdoors, especially at dawn, twilight, and night. Don’t leave yourself outdoors alone on a borderland jogging or hiking path, at dawn, twilight, and night. Make sure animals are protected with covered shelters. Protect your perimeters with motion-sensor lights outside your home. 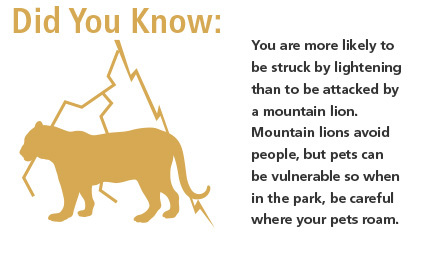 What if you’ve done all this and still see a mountain lion? Do not, under any circumstances, get closer. Do not, under any circumstances, run. Do not pop a squat, crouch, or lose eye contact. Do pick up small children. Do make yourself look bigger and noisier. Support mountain lion protection: check out the nonprofit Mountain Lion Foundation. You need to be a member of Animal Rights Zone to add comments!